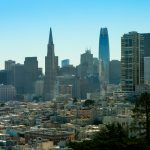 A majority of San Francisco interns will be working in the Financial District and would prefer to stay somewhere close to the company they’re working for. If you’d like to be within walking distance of downtown, The Telegraph Hill apartments are one of your best bets in the area. Located at 350 Union Street next door to the famed Coit Tower, this property features newly-renovated and classic studio apartments along with a roof deck and skyline views. You will feel just like a local while watching the sun set as you sip a happy hour cocktail on the roof deck of your new home. The Telegraph Hill area is also known as a mecca for food, drinks, and history. Restaurants, cafes, bars, pizzerias, and much more line the streets around Washington Square Park, giving you plenty of local after-work and weekend options to try. Some of the best options include Tony’s Pizza Napoletana, Original Joe’s, and Park Tavern. Another popular area for San Francisco interns is the trendy and urban SoMa or South of Market neighborhood. Market Street, which is one of San Francisco’s most busy streets, is lined with large company headquarters and is constantly bustling with workers. Both BART and MUNI transit lines run down Market Street and have stations located at Civic Center next to Trinity Place. This neighborhood offers easy transportation to anywhere in or outside of SF with proximity to all the major events occurring downtown. Currently, Trinity owns and manages three high rise apartment complexes surrounding the largest statue in San Francisco, Venus. This urban oasis features a serene plaza and seating for residents and locals to enjoy sunny San Francisco days. Nearby venues include The Orpheum and Golden Gate Theater as well as the headquarters for Twitter and Uber. Interns looking for flexible leasing terms and fully-furnished units are encouraged to view the available studio and one bedroom apartments at 1188 Mission Street. Trinity also offers unfurnished Trinity Place apartments at 33 8th Street and 1190 Mission Street. 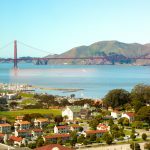 The residential Pacific Heights neighborhood has always been known as one of San Francisco’s most exclusive areas. Popular with San Francisco’s tech billionaires, the prestigious Pac-Heights is also highly regarded for its grassy parks and colorful Victorian homes.. 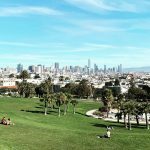 Residents of the neighborhood frequent the bars on Fillmore and Union Streets and find themselves soaking up the sun at Alta Plaza or Lafayette Park. You can become one of these happy residents at the 2000 Broadway Apartments or Clay Park Tower in Pacific Heights today! Each of these properties are located close to MUNI lines and are central to most activity in SF. If you need a studio, 1 bedroom, or 2 bedroom apartment in a peaceful yet accessible location, this is the place for you! Chances are if you like to go out at night, you’ve heard of The Marina. Renowned for its boisterous clubs and bars, The Marina is also a scenic and historic piece of San Francisco. 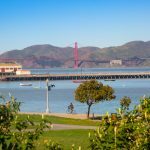 With jaw-dropping views of The Golden Gate Bridge, nearby public spaces such as Fort Mason, Marina Green, and Crissy Field are popular recreational destinations for Marina residents. A tourist friendly area, Chestnut Street in The Marina is often the site of bar crawls and large celebrations. The best bars in The Marina include The Dorian, Final Final, The Brickyard, The Tipsy Pig, Del Mar, and Horseshoe Tavern. 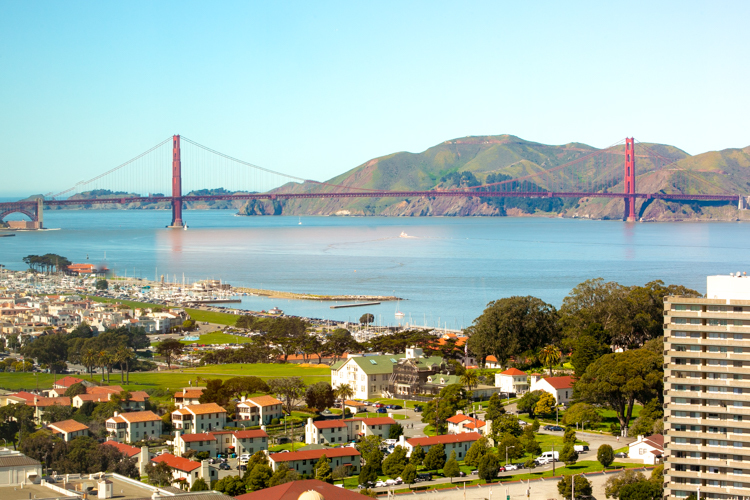 Interns looking to truly enjoy their time in San Francisco are certainly advised to spend some time in The Marina. If you’re looking to live in the neighborhood, Trinity offers fully-furnished studio and one bedroom apartments perfect to accommodate interns and temporary workers. Looking to elevate your San Francisco experience? The steep and exercise-friendly Russian Hill neighborhood features some of San Francisco’s most ritzy homes and arguably the most gorgeous views. Popular with tourists and locals alike, Russian Hill has many swanky cafes and restaurants while also catering to travelers with venues such as Ghiradelli Square and the crooked section of Lombard Street. Residents can often be found enjoying the many venues around Aquatic Park or swimming and biking at the Maritime National Historical Park. Among the elite housing options in the area are the apartments at 1000 Chestnut Street. 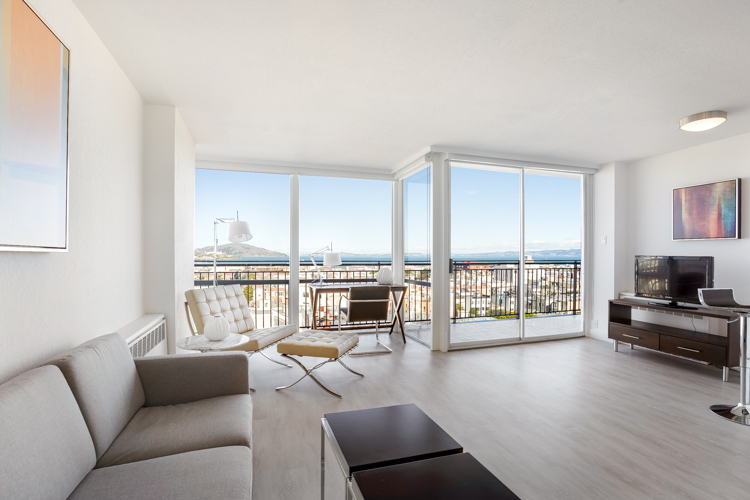 This luxury high-rise property has available one, two, and three bedroom apartments ready to move in today. With beautifully designed furnishings, linens, cookware and more, these Russian Hill apartments are sure to impress your guests. Imagine coming home from your internship to skyline views and a professionally designed home. Now that’s living the high life! Another neighborhood close to the many companies in the Financial District is North Beach. This contemporary district includes popular travel destinations such as The Embarcadero, Pier 39, and Fisherman’s Wharf. There is no shortage of places to eat and drink but the real fun is to be had at the many performances hosted by nearby clubs and auditoriums. 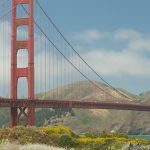 Comedy and music shows are a constant with acts from across the world traveling to perform in the area at famous clubs such as Punch Line San Francisco and Cobb’s Comedy Club. High-rise fully-furnished apartments in North Beach are uncommon but Crystal Tower has availability in both 1 and 2 bedroom units. Look out at Alcatraz and across the bay from the comfort of your home. These apartments are sure to be in high demand this summer so make sure to act now and secure housing for your internship!